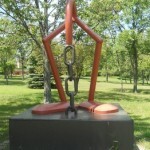 Our family recently visited Pyramid Hill Sculpture Park in Hamilton and we were all overjoyed with our newest discovery. I am kicking myself (well, not literally – ouch) that we did not get to this amazing park before. 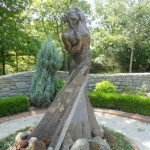 The park is gorgeous and it combines nature and art in the most beautiful setting. I don’t think words can do it justice but photos sure help. When you arrive, your car has to climb up and up to get to the visitor center. In my mind I had visions of the “Little Engine who Could”. At the visitor center you can purchase admissions to the park ($8/adults and $2/children). We were lucky since I just purchased a Groupon Cincinnati and received an annual family membership for only $20. I think this is one of the best buys I have ever made for our family. 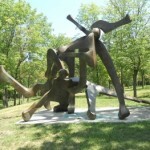 The park is huge with over 265 hilly acres filled with amazing art to see. You can enjoy the park three ways, by walking, by car or by golf cart (a.k.a “art cart”). We opted to rent an “art cart” so that we could see most of the park without getting the kids too worn out. Plus, it’s just plain ol’ fun to tour around in an “art cart”. The “art cart” was $18 for an hour rental for members and $10 for each additional hour. Make sure you pick up a map since it also shows a picture of all the art sculptures and where they are located (63 art sculptures are featured on the map). Stepping outside of the visitor center, the view to the right was gorgeous. 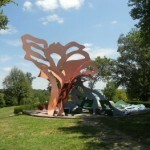 Large pieces of art are interspersed between rolling hills, prominent trees, and lush landscapes. I snapped a few pictures before we headed down to find our “art cart” located near the Ancient Sculpture Museum (free with park admission). 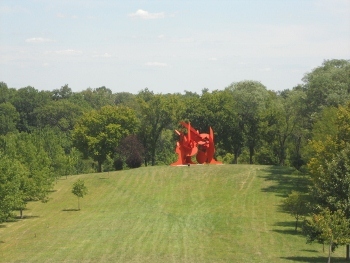 There are four areas of the park: East Ridge, North Woods, Central Valley, and Overlook Hill. 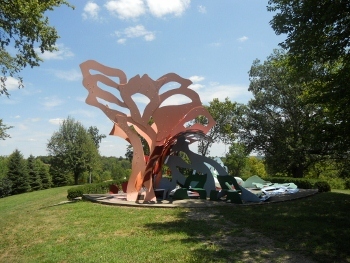 Our first stop was in Overlook Hill where we saw the sculpture “Cincinnati Story” by artist George Sugarman. We parked the “art cart” and walked close to the majestic and colorful sculpture. Beyond the sculpture was an amazing view of the lake area below. 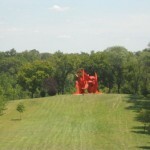 In the distance the fire red “Abracadabra” sculpture by Alexander Liberman was something to see. Plus there was a nice patio overlook area with plenty of seating for you to sit and enjoy the view or eat a picnic lunch. Next time we visit, we are packing a lunch for sure. In the Central Valley, we stopped to check out the “Early Pioneer House” that was made of stone in the 1820’s. You could actually enter the small arched entryway and imagine a different time. 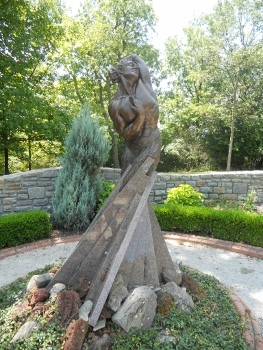 The view across the path was of “Tory’s Comment” by Harry Gordon. This was a huge wooden sculpture. From here we walked along the gravel path and enjoyed the beautiful greenery surrounding us. 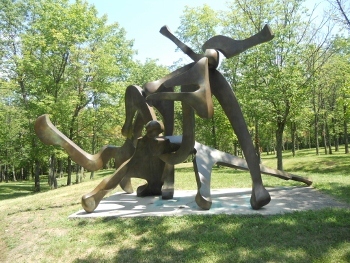 The East Ridge of the park has the most sculptures to see. Some of our favorites included “Paul” by Martin Gantman. 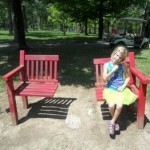 This was a red park bench that was split in two but you could actually test it out. 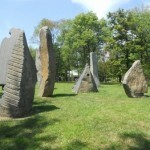 My favorite was seeing “Age of Stone” by Jon Isherwood. You could walk in and all around these huge stone monuments. My oldest enjoyed seeing “Melinda at the Beach” by Bill Barrett. She commented, “these really make your imaginations work, I see a big elephant and a cat in this one”. I’m not quite sure if we were looking at the same sculpture or not but they say art is all about interpretation and maybe an elephant and a cat were hiding in the piece somewhere. Looking up and in the distance we saw an amazing view of a glass pyramid. K started jumping up and down exclaiming that’s why they call it Pyramid Hill”. 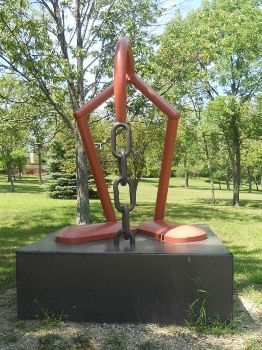 The North Woods had some fun art. “Still Life” by Ed Benevente looked like two giant red feet. We all got a kick out of seeing the statue of a man sitting on a park bench waiting for a friend. It’s called “Untitled” by John Leon. Both S and I couldn’t let him sit by himself for long so we joined him. He’s a lucky man since he can enjoy such breathtaking views every day. “Untitled” was also very close to the glass pyramid we saw from below. 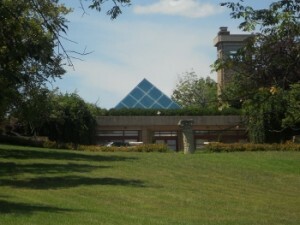 As we got closer to this, we realized that the glass pyramid is actually someone’s residence so don’t take the “art cart” along the path marked “private drive” like we almost did. We continued our journey stopping at a beautiful flower garden. Inside was a gorgeous sculputre called “Adams’ First Breath” by Sam McKinney. If you are looking for a great place for a family picture, the flowers in the garden would be the perfect back drop. 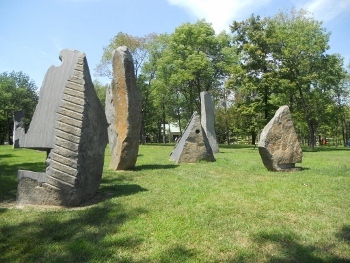 Pyramid Hill Sculpture park also has plenty of nature trails, and picnic areas to enjoy. Plus, make sure you stop by the Ancient Sculpture Museum filled with Egyptian and Greek art. The outdoor courtyard was beautiful too. If you have kids, just keep them close and remind them to use their museum quiet voices. There is also a clean restroom inside the air conditioned building. I hope you and your family will visit Pyramid Hill one day soon. We plan on returning in the fall so we can see some of the beautiful colors of the fall foliage. 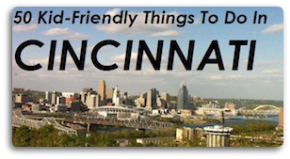 When not blogging for Family Friendly Cincinnati, you can find Kristin writing on her personal blog, MasonMetu (from me to you).